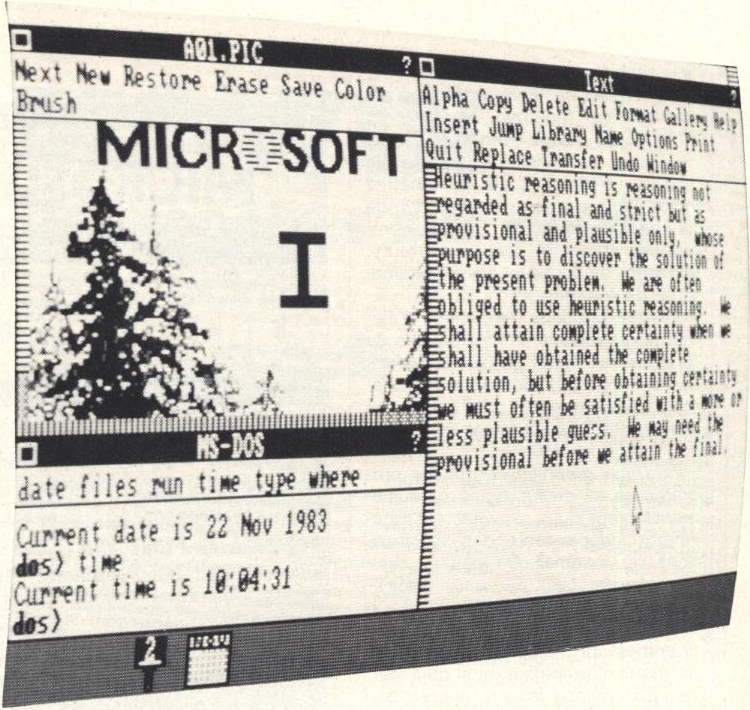 They were found in the February 1984 issue of Micro Ordinateurs. Due to much higher quality of the two known photos (one could even call it "superb" quality, considering they're from 1983), I can confirm what I already said. There's a digit 2 on the Art icon at the bottom, the menu bar is now narrower since the descenders of letters are now touching the bottom border, the "dos>" prompt is now in bold and the question mark in the help button sits slightly lower and is aligned with the close button. The second photo is a bit cut off on the right, but it still confirms there's three Art icons at the bottom, with the one on the far left having the digit 3 (something I haven't seen thus far). This makes me wonder once again whether the icon changes if you open these A0*.PIC demo images. There is indeed no buffer space between the text and the menubar in Calendar. And then there's this third photo not seen in Golden magazine, this one being slightly cut off on the left. At the bottom we have minimized instances of Calendar and Art (twice). We get to see what A03.PIC looks like - a house with a tree next to it while it's snowing. 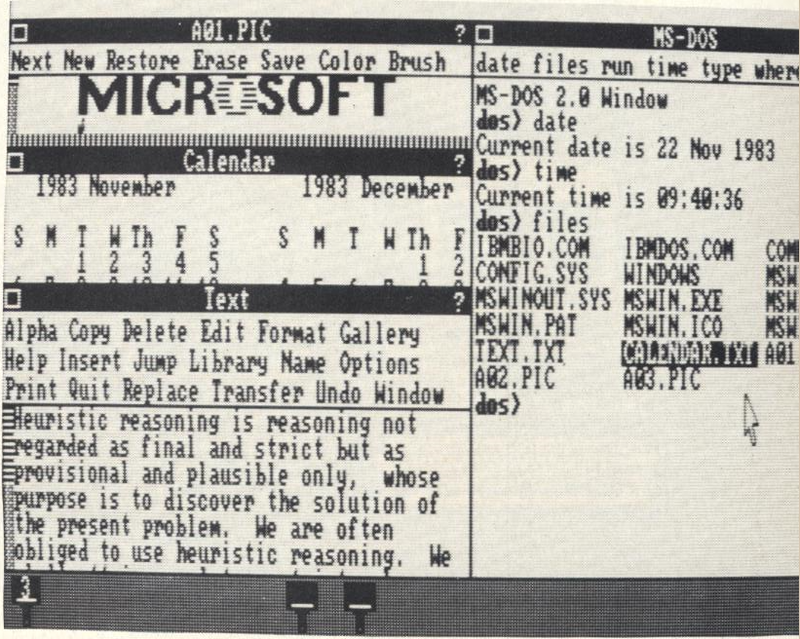 Above it is A01.PIC and on the right we have Text and MS-DOS windows. The final detail I'd like to point out is the dropdown menu in the A03.PIC window. We've seen what these look like in the announcement/InfoWorld build, but this one is slightly different. Notice it's not touching the title bar like it did in previous build(s). This is consistent with my reconstructed timeline, since the COMDEX build exhibits the same behaviour. 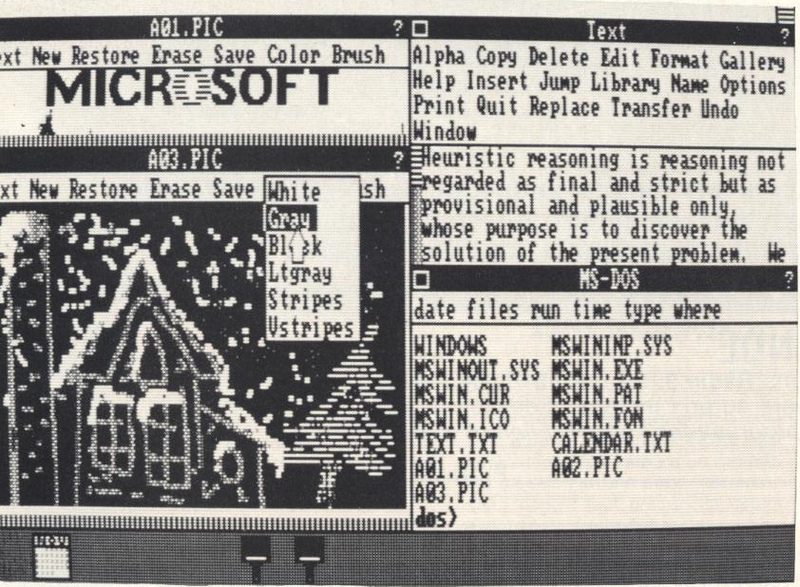 It's worth mentioning this third photo was also published in October 1984 issue of Micro Systemes, albeit in somewhat lower quality. That's all I wanted to say in this quick update. I've also found several photos of later builds, which will be discussed once I get there. In part 5 (which should drop next week) I'll go over the build shown in the COMDEX promotional material by Microsoft.